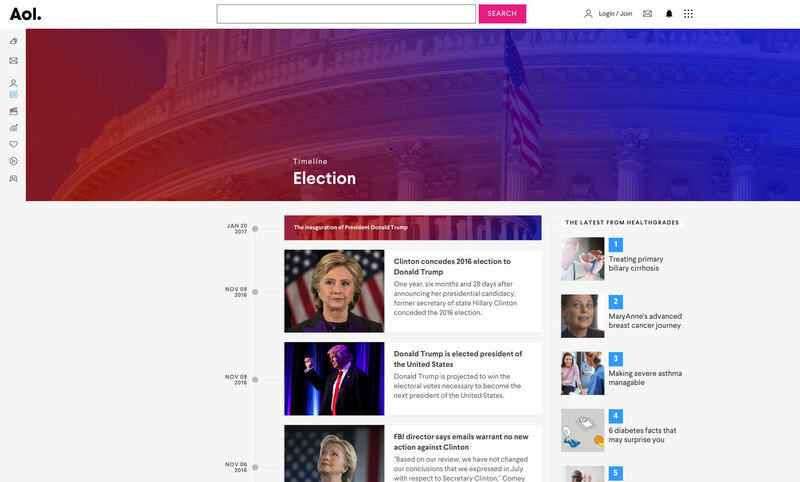 Before the heat of the election season started in 2016, my team was planning to create an overview of all the notable events in the election so far. What began as just one timeline became several, as I took the designs for this page and carefully crafted the entire layout to be reusable and extensible from the beginning. I reused this component five times, and while the initial design took just about a month to complete, subsequent implementations took only a matter of days. When looking at the data for the timelines, the most interesting thing is that users both spent a lot of time on the page and kept coming back. That absolutely makes sense. The way this page is designed means that content gets updated over time by the AOL editors, so users who keep coming back get to see updated stories and get to see those stories in context, too. The ability to make your code modular and reusable is integral to any software engineer’s workflow. I saw this firsthand, because putting in the extra effort the first time allowed me to reuse my work effortlessly.